accept a small minus to get a big plus ! 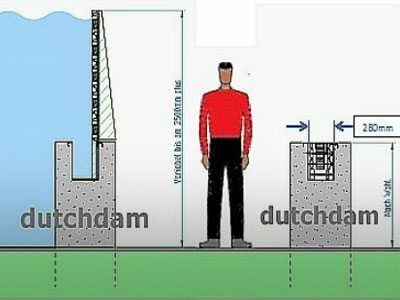 Dutchdam installed many deployable flood barriers with heights up till 5ft./1.5m. This will change, flood levels increase, we need higher flood barriers, possibly even as high as 10ft./3m. The materials for those heights are no longer easily stored in boxes below ground level. That’s why Dutchdam introduces the new ‘Double-dam’. But we will stay insitu and store all materials above ground level. 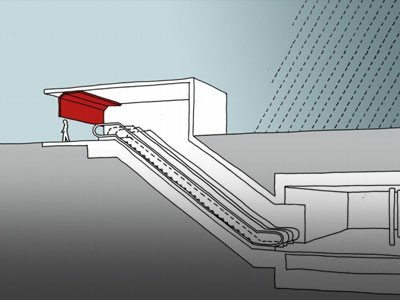 The flood barrier is instantly available. Such a design is -seen from the technical point of view- as a firm step forward. As well as the effects for the client and the water safety. 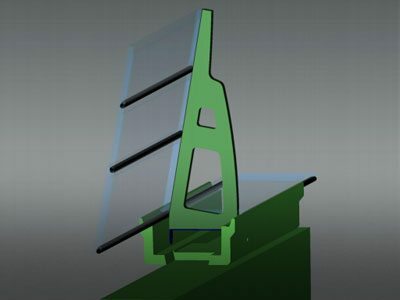 The first part of the barrier (stored at half of the defence height) is shaped as a box and holds a second part. That second part can be lifted to reach the full height of the barrier. The first part, the box itself, can turn like a door to become a flood barrier for the upcoming flood. In case the water level seems to overtop this first part, the second part is available to increase the height. Putting the barrier in place requires very limited man power and lead time. This new ‘Double-dam’ is strong, stable during storms from each direction (also before flood water arrives) and fast. 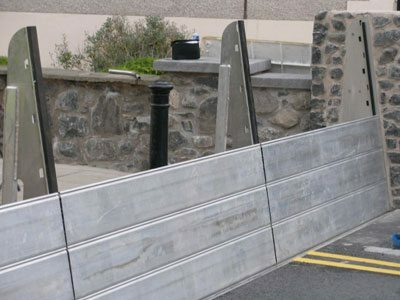 A flood barrier always on site protecting the community, the landscape, view and access when not in use. 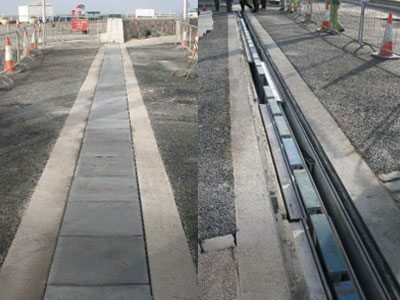 This ‘Double-dam’ can reopen the site for local traffic immediately after the flood is gone, and includes a high standard of operational security. Read more, see two fact sheets..
Dutchdam stays away from automated working systems, with vulnerable parts used for its operation such as pumps, pipes, valves, electric drives, electricity supply and hydraulic or floating systems. Read more.. 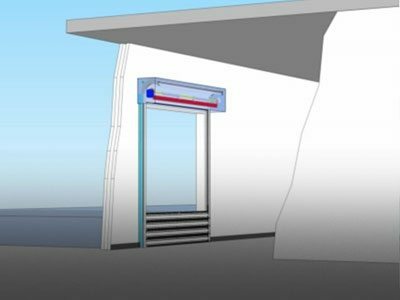 Architecture and well integrated flood barriers will be the future for flood prone areas. Investors and city planners will face more sudden rainfall (flash-) floods aside floods caused by river discharge and/or coastal flooding. 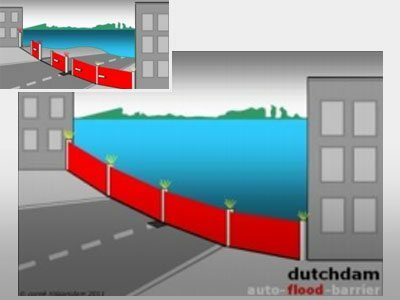 Dutchdam represents custom design in flood defence. As usual the flood barrier is completely stored on site in its own gutter box. The gutter box and its covers are 4x coated galvanized steel. The stanchions and wall plates are made out of Stainless Steel. The panels are in high load composite, each internally locked. Strong, reliable and durable. In place in 10 to 15 minutes. 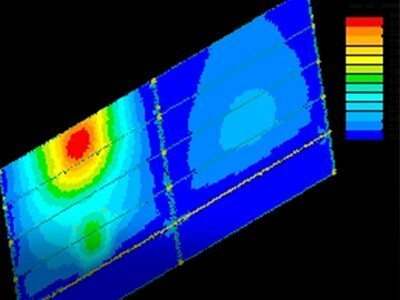 To elevate all shoreline structures to a permanent maximum safety level is not realistic. Besides the technical and financial feasibility, it ruins landscapes, blocks the view on and access to the water. The accessibility of the shorelines represents an enormous economic value worldwide, especially in deltas, harbours and along the waterfronts.